Please refer to our stock # 40F52 LP07 when inquiring. 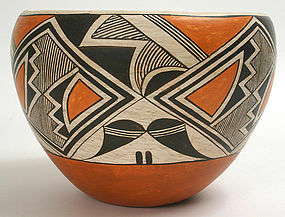 A pottery bowl or olla by the matriarch of the Acoma Pueblo, New Mexico, Lucy Martin Lewis (c.1899-1992). Circa 1940. This wide mouth pottery bowl was hand decorated in red and black colored slips with geometric designs inspired by the earlier Mimbres pottery. Though the vessel is unsigned, it is attributed by its decoration to Lucy Lewis, one of the most respected Acoma women potters. She began decorating pottery at the age of 7, and her daughters continue the potting tradition today, using traditional methods and designs. Excellent condition. Size: 9.5" diameter x 6.75" ht.